So speaking of autumn, I am just not sure it is ever coming to Oklahoma where I live. I relocated here for a job but was so excited that one perk would be to experience all 4 seasons again. In Dallas, we mainly got some spring and fall but mostly summer. No such luck dears. I unpacked the sundresses and sandals today and have turned on the AC in the condo. My boots and jackets are the saddest. So needless to say I have been busy reminiscing through old autumn photos ( so dissapointed that I was sweating at this year's fair and Oktoberfest) and have been super busy creating all of my favorite fall dishes in the kitchen. Oh..and if you need some gorgeous fall inspiration, just go to instagram and check out the AMB AUTUMN hashtag. (#abmautumn) It's my absolute fave thing on social media right now. I guess I can live vicariously through everyone else experiencing fall weather currently. In the meantime, at least I can create it in my kitchen, right?! 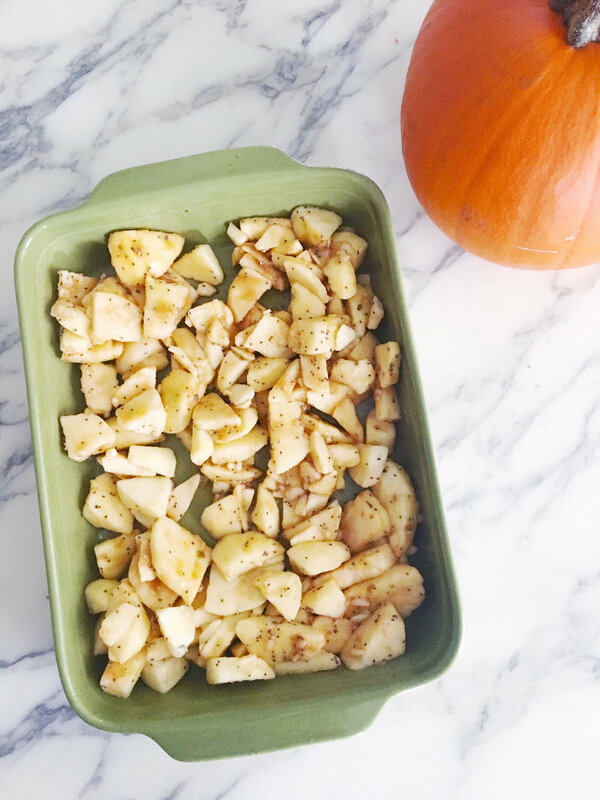 So here are my fave recipes to get you in that fall mood loves. The best part is they are all super low calorie too so no need to feel any guilt as we approach that Thanksgiving meal. Preheat the oven to 375 degrees. Lightly grease an 11 by 9 inch baking dish. Make the apple filling: place the apples in a large bowl and sprinkle the arrowroot powder on top. Toss until combined. Stir in the sugar, chia seeds, and cinnamon. Add the lemon juice and stir to combine. Pour the apple mixture into the prepared dish and smooth it out evenly. Make the Topping: in a large bowl (you can use the same one you used for the apples), stir together the oats, almonds, almond flour, maple syrup, melted coconut oil, shredded coconut, (if using), cinnamon, and salt until thoroughly mixed. Cover the dish with foil and poke a couple of air holes in the foil. Bake for 35 to 45 minutes, until the apples are just fork tender. Uncover the dish and bake for 10 to 15 minutes more, until the topping is golden and fragrance. Serve with a scoop of dairy free vanilla ice cream if desired. I am personally loving the halo top ice cream. The whole pint is under 150 calories! The leftovers are fantastic cold, straight from the fridge, or you can reheat it in the oven for 15 to 20 minutes. It’s healthy enough for breakfast the next day too! Tip: This crumble works with other fruit too, so use whatever is in season. Peaches and blueberries are a nice combo, although they produce a much juicier crumble. Another Oh She Glows recipe that your whole family will love is her Indian Lentil-Cauliflower soup. Curry powder and fresh ginger are sure to warm you up on a cool brisk fall night. This soup is also so inexpensive to prepare and this one gets better with age so the third day leftovers on this are my favorite. And I really am not a leftover girl. It's so good dears. In a large saucepan, heat the oil over medium heat. Add the onion and garlic and saute for 5 to 6 minutes, until translucent. Stir in the ginger, 1 tablespoon of the curry powder, coriander, and cumin and saute for 2 minutes more, until fragrant. Add the broth and red lentils and stir to combine. Bring the mixture to a low boil, then reduce the heat and simmer for 5 minutes more. Stir in the cauliflower and sweet potato. Cover and reduce the heat to medium-low. Simmer for 20 to 25 minutes, until the cauliflower and sweet potato are tender. Season with the salt and pepper, and add more curry powder, if desired. Stir in the spinach and cook until wilted. Ladle the soup into bowls and top with cilantro, if desired. One serving is only 280 calories and it is filling so I can never do seconds on this ! Lastly, its no secret that I adore Gwyneth Paltrow's recipes. And her black bean soup is pure perfection. It's amazing on a chilly night and it's so quick and simple to prepare. You can whip this soup up in just minutes and everyone will just love it. Heat the olive oil in a heavy-bottomed pot or casserole dish over medium-high heat. Add the onion and salt and sauté for 5 minutes, stirring often and lowering the heat if the onion starts to brown too much. Add the garlic, coriander and spices. Cover and cook for 5 minutes more, checking every minute or so to make sure everything is gently sautéing and not burning. Add the black beans and chicken stock, bring the mixture to a boil and simmer, uncovered, for 15 minutes. Using an immersion blender, blend the soup directly in the pot until almost completely smooth. Adjust the seasoning to taste. Serve with cheese, sour cream, tortilla strips, avocado, fresh coriander and fresh limes. I hope you enjoy these ! Tag me on insta in your photos. I would love to see.